If you got here via social media, I apologize for the irony. There’s no arguing that social media is a great way to share articles and ideas. But does the endless thumb-scrolling have any negative side effects? As the New Year rolled in, I couldn’t help but notice a common theme running through my newsfeeds: Spend less time on social media. Some friends even vowed to go cold-turkey, committing to a full social media “cleanse.” I found it particularly interesting that this resolution wasn’t limited to any specific generation. It seems that regardless of age, we’re all having an equally hard time stepping away from our social media accounts. “I find myself mindlessly scrolling through Facebook if there’s nothing else to do.” This was the most common response I received when I asked friends and colleagues about their recent decisions to limit their social media usage. For many of us, it has become second nature to whip out our smartphones and flick through our social apps any time there’s a lull in activity or conversation. The fact is adults now spend an average of 1 hour and 40 minutes browsing social networks every day. And Americans are some of the worst offenders. On average, we check our social media accounts 17 times a day. Clearly, a resolve to spend less time on social media is an attempt to change this behavior. To be fair, some of this time may be put to good use catching up on the day’s news or keeping up with friends and family. But, unfortunately, our social media habits aren’t always so purposeful. The good news is that limiting your social media binges may save you from health risks associated with over-usage. Losing sleep. We’ve all found ourselves checking our social media apps in bed at night. While this is a comfy way to catch up, according to Denise Bundick, this habit can interfere with our sleep cycles. Bundick is a licensed clinical social worker with over 25 years of experience and she is a team member at Blue Cross and Blue Shield of North Carolina. She points to a 2012 study that showed that even a two-hour exposure to light from smartphone and tablet displays can suppress melatonin, a hormone that signals to the body that it is time to sleep. This can lead to sleep disturbance and can have significant effects on health over time. Changing the way we think about food. Has your mouth ever started watering after you see a picture of a delicious meal on Instagram? That’s because viewing images of indulgent foods can activate the brain’s reward center and make you want to eat unhealthy foods. Even after a meal, looking at those #foodie posts can still trigger hunger and lead to overeating. Lowering self-esteem. Have you ever felt down while thumbing through your newsfeed? You’re not alone. One in three people report feelings of loneliness, anger and frustration after spending time on Facebook. This is often caused by viewing heavily curated slices of others’ lives, which can lead to unfair and unnecessary comparisons. After all, people usually only post on social media when they’re doing something exciting or luxurious. Reducing self-control. Studies have linked social media usage with lowered self-control and impaired consumer judgment. That’s right. Being on Facebook for just a few minutes can lead you to spend more money than you otherwise would. Increasing the odds of mental health problems. Social media use has been linked to social anxiety, low productivity, cyberbullying, reduced information processing, and addiction. And to add insult to injury, it makes children more likely to experience psychological distress and increases feelings of isolation in young adults. If you’re rushing to delete your social apps right now, hold on! Thankfully, not everything associated with social media is doom and gloom. 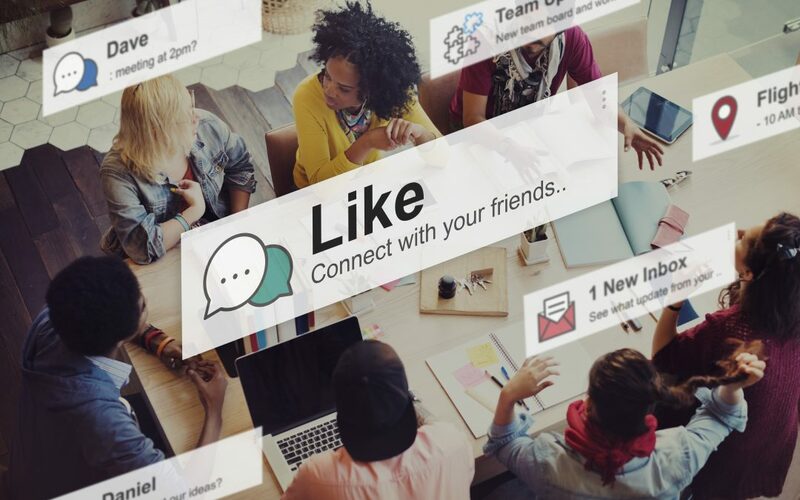 Though negative behaviors can influence social media users, evidence indicates positive behaviors of friends (like watching a friend go on a weight loss journey) can be inspirational and may cause users to maintain healthier habits. Social media also has the potential to help in the management of chronic diseases and illnesses. It gives those who are affected a platform to share information and offer one another support. What’s more, social media can give those struggling with social anxiety or other difficulties some relief. According to Denise Bundick, people with these struggles often isolate themselves from others. Before the rise of social media, many of these individuals would isolate themselves in their homes, but they are now able to build “safety zones” where they can interact with others and feel a sense of connection that was not previously available. So what’s the takeaway? Everything in moderation. Too much of a good thing can sometimes come at a cost (see again: chocolate). So the next time you find yourself trapped in an endless Facebook-Twitter-Instagram loop, make sure you’re balancing it. Add in a good book, a quick workout or some (real) face time with your friends. Your body, mind and bank account will thank you.